Steeped in tradition, the world’s most famous cycling race is soon to kick off for the 105th time. 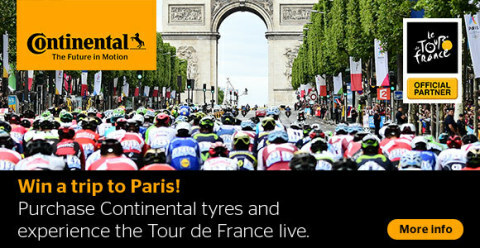 Customers of Mytyres.co.uk now have the unique opportunity to travel to Paris and watch as the teams cross the finishing line in one of the world’s most popular sporting events. In cooperation with premium manufacturer Continental, the online shop is giving away 15 places on a trip to the final stage of the Tour de France on the Champs-Élysées on 29th July 2018. Travel, accommodation, and transport is included for all participants. Participation is very easy. Simply buy at least 2 Continental summer tyres via Mytyres.co.uk before 6th May 2018, complete the registration form on the order confirmation page, and cross your fingers! The Continental tyre range available to customers on Mytyres.co.uk includes all current summer models. The campaign takes place in 15 European countries. One winner will be selected from each country. From 28th to 30th July 2018, the mixed international group will travel to the dream city of Paris and experience the spectacular atmosphere on the Champs-Élysées at the Tour de France finale live together with millions of cycling fans. The cycling race is one of the toughest and most important in the world. It has taken place every year since 1903. For three weeks, the best cyclists in the world criss-cross France and neighbouring European countries in a variety of sprint and mountain stages. This latest giveaway is just one of many exciting competitions Continental has run in conjunction with Mytyres.co.uk. Among other destinations, past winners from several countries have travelled to Iceland and Namibia, as well as to the finale of the European Football Championship.